Story: It's summer!!!!!! if you live in a place that's cold 6-9 months out of the year.. you'd understand the exclamation marks.. Coming from a city close to Mumbai, as a visitor I did not understand the obsession with summer in New England. But once I moved here it took just one winter for me to realize why a Bostonian stops just to say to a complete stranger, "What a gorgeous sunny day!!" Summer here means outdoor activities, BBQs, short clothes, beaches and loads of tasty seafood.. Today's shrimp salad is just perfect for a summer BBQ. The other day we had this salad with grilled salmon, garlic bread and an orange juice cocktail. The whole thing was fabulicious! Cut the cherry tomatoes in halves. Arrange these pieces in a baking tray. Drizzle about a tbsp of olive oil over the tomatoes followed by a sprinkle of salt, pepper and oregano leaves. Broil with medium/high flame in the oven. For 5-10 minutes or till you see a char on the tomatoes. While the tomatoes are broiling, peel the shrimps. Rub a little bit of salt and pepper on the shrimps and keep aside. Once the tomatoes are done, transfer them to a serving bowl. Heat the remaining olive oil in a non-stick pan and add the shrimps to it. It is very easy to overcook shrimps.. I usually cook them for 15 ish seconds on each side and they are cooked within half a minute! At the end add the Basil leaves and mix well. Cut the Shrimps unevenly into half-inch pieces. and add to the serving bowl. Toss them with the tomatoes and add salt and pepper to taste. by the way, what a gorgeous sunny day! 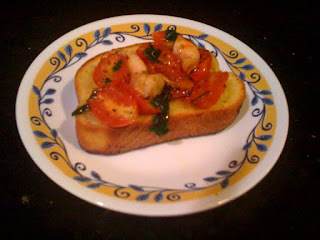 Nice recipe - summer is all about fresh ingredients and living outdoors! !